This resource offers opportunities to develop and explore the history of Scotland. 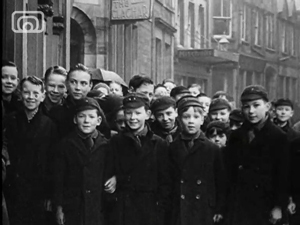 Children will be encouraged to look at similarities and differences between childhood today and in the past. It encourages them to think about the changes in their own lives and in those of their family or adults around them. The approach used in this resource could be developed to include the study of other everyday things from the past, e.g. clothes, games. It introduces children different types of evidence and offers opportunities to discuss and evaluate these. This resource offers many possibilities for cross curricular work. Treasure Island (1935) is a local topical film sponsored by the Playhouse Cinema in Inverness. Local topical films were short films that had been taken in the local area; they attempted to film as many people from an area as possible. The cinemas then screened these short films before a main feature, hoping that people would come to the cinema to see themselves on the big screen! This film can be shown to introduce the idea of looking at film a piece of evidence of what life was like in the past. Create a thinking and talking book to collate children’s thoughts about the film. What are the people in the film wearing? What is their hair like? Why do you think there are so many children going to the cinema? Do you enjoy going to the cinema? What are the similarities/differences between a day at the cinema then and now? What type of shots are used in this piece of film? Why do you think the film maker used these shots? Out for Value (1931) is a promotional film made by Jay's Film Service, sponsored by Isaac Benzie's Department Store. 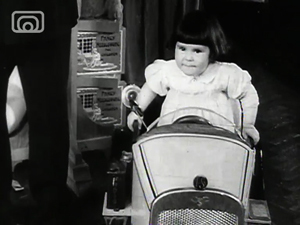 The film shows a family day out to the store, visiting all the departments and even getting a haircut. This clip offers opportunities to discuss similarities and differences between past and present through the context of the childhood activity of a family day out. Would you like to visit the department store? What is your favourite department? Linking with the previous clip, can the children see similarities with how the people in the film are dressed? In pairs children draw/write/record all the departments the family visit. Using the capture tool on the smart board, capture scenes from the clip. Ask children to drag them into the correct order. In small groups children create a voiceover or sound track for the clip. In small groups children create a voiceover or sound track for the clip. Extension: children create a voiceover form the point of view of one of the characters. Compare and contrast the thoughts and feelings of each of the characters. 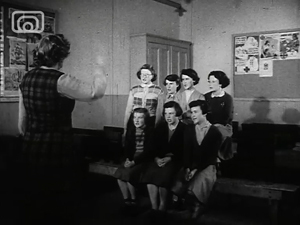 Crofter Boy (1955) is a dramatised documentary of life in a crofting community. It was made in 1955 by Thames and Clyde, sponsored by the Scottish Educational Film Association (SEFA) and the Scottish Film Council (SFC). The film was directed by Stanley L. Russell. We meet Kenny the crofter boy and his family who live in the crofting community of Invergair. Kenny travels 14 miles to school by car and bus, the lessons begin and we see boys doing woodwork and playing shinty during the interval, and girls singing in the Gaelic choir. The previous clips have focused on life in the past from in a town or city. This clip offers the children the opportunity to explore a crafting community. There is the opportunity to compare and contrast this clip with the previous two. It also lends itself to a more in-depth look at the different childhood experiences of a child growing up in a crofting community. Create a class display based on Kenny’s life, using what we find out in the film and children’s thoughts and ideas based on other sources – books, websites, homework research etc. Working in pairs, children write, draw, record (using voice recorder or Dictaphone) a day in the life of Kenny. Children discuss with their families what a typical day in their lives is like. Bring in pictures and notes about daily family life in order to take part in the next activity. Using information gathered as part of homework task children can compile their own ‘A day in the life of..’ Children can choose how to record their information e.g. PowerPoint, written story, comic book, audio recording, referring back to the Crofter Boy format. This lesson guide was written by primary teacher Ciara Sterrett.